Description - Shaw Chain Reaction features a patterned floor design available in 12 bold colors that are sure to go with any room’s décor. To create a truly unique space, this tile can be installed in a Quarter Turn pattern to create fun and unique patterns across your whole floor or area rug. For most installations, these carpet tile squares can be installed with double-sided tape but when that is not enough, a pressure sensitive adhesive is all that is needed. These tiles are also very ‘Green’ having a backing that is 100% PVC free and nylon fibers that are constructed with at least 45% recycled material. 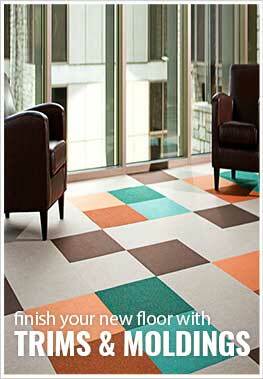 Chain Reaction tiles are also backed by a lifetime warranty, and can be installed anywhere broadloom carpeting can. So if you are looking for a floor that is not only easy to clean and maintain but is good for the environment, then Shaw’s Chain Reaction tile is for you. Weight - 0.83 Lbs./ sqft. Recommended Uses - Chain Reaction Carpet Tiles have been used in both commercial and residential applications because of their durability, versatility and ease of installation. Because of these facts, carpet tiles are quickly replacing broadloom carpet and have been installed in nurseries, basements, kitchens, bedrooms, weight rooms, home gyms, garages, workout rooms, and elderly care rooms and many other areas. Periodic maintenance can be performed as needed using a hot water extraction-cleaning machine(i.e. carpet cleaner). Carpet tiles have a backing that prevents water from penetrating or harming the tiles. Made with 45% recycled material.